Heat up a small round pan with a tablespoon of oil then gently crack an egg into a cup then slowly drop it into the pan. 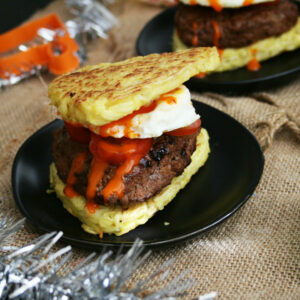 Serve cooked burgers on noodle buns with fried eggs, tomatoes and spicy mayo. If you do not have triangle shaped cookie cutters, you can use circle cookie cutters to cook circle noodle pancakes then cut out triangles.